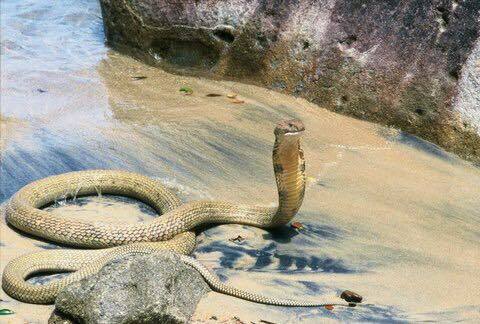 The reported King Cobra at Shelly Beach turned out to be an April Fools joke. OF THE Sunshine Coast's April Fool's Day jokes, this could have been the most frightening. Sunshine Coast Snake Catchers 24/7 caused a stir last Saturday, April 1, when they posted a photo of a King Cobra to Facebook, claiming it had been spotted at Shelly Beach. "After getting a call from a lady at Caloundra about a large snake on the beach we assumed either a large Sea Snake or the usual Carpet Python .... but then she texted through this picture!" the page's administrators announced. "As you can imagine I jumped straight in the car and managed to catch the large 2.5m cobra before it moved off into the bushland. How do you feel about April Fool's Day? This poll ended on 10 April 2017. It's great for a laugh. I played a fantastic prank. I didn't prank, but had a laugh when the jokes were played on me. "King Cobras are not native to Australia, making this individual either an illegal escaped pet or an unknown stowaway on a barge ship." An update the next morning confirmed the post was indeed a April Fool's Day joke. Most were just relieved to know it was a joke, while others pointed out an Australian King Cobra would mean the nation could claim to have all of the world's ten most venomous snakes. Plenty more called out the page for breaking traditional April Fool's 'rules'. "As at least 1000 people have let me know, I realise that the joke is on me for posting after midday," the page later posted.